Chinese relatives of passengers aboard missing Malaysia Airlines flight MH370 marched to Malaysia's embassy in Beijing (Pictured) and some demanded they be flown to Reunion island where a part of a wing was found. Most of the flight’s passengers were Chinese. About 30 relatives protested near the embassy, as dozens of police blocked off roads near the building. Earlier, they gathered at an office in the hope of meeting Malaysian officials, although none arrived. Several demanded that Kuala Lumpur organize travel to the French Indian Ocean island, where a wing part was found. Malaysian Prime Minister Najib Razak confirmed early yesterday it was from the plane. But French prosecutors said only there was a “very high probability'' it was from the Boeing 777 that disappeared. Lu held a sign appealing to President Xi Jinping to help, but had harsh words for the dozens of security personnel present. 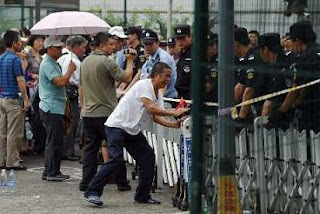 “The Chinese government has only repressed us. Look at all the police here.. they come to our houses and stop us from giving interviews... They want to cover up the truth,'' he added. “All the relatives want to go there,'' she said. “Malaysia is the country responsible and they should obtain the relevant documents,'' he added. The Malaysia Airlines flight, with 239 people – including 153 Chinese – on board, vanished en route from Kuala Lumpur to Beijing in March last year. “The Malaysian government have refused to send anyone to meet us,'' said Jiang Hui, whose mother was on the flight.